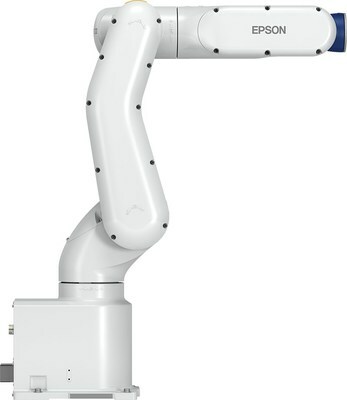 CHICAGO, April 8, 2019 — (PRNewswire) — Epson Robots, the #1 SCARA robot manufacturer in the world, today announced at Automate 2019, the new VT6L All-in-One 6-Axis robot, a new entry level offering to the award-winning 6-Axis line up. This compact, easy to install robot includes next generation technology, is ideal for a wide range of simple applications and is offered at the ultra low cost of $13,900. Available in June, the VT6L robot will be showcased at Automate, McCormick Convention Center, April 8-11 at Epson Robots booth #7566. The VT6L is ideal for simple parts transfer applications such as machine-tool and injection molding load/unload, pick-and-place, dispensing and simple assembly projects. The All-in-One design with built-in controller saves on valuable factory space while its SlimLine structure featuring a compact wrist pitch enables access to hard-to-reach areas in confined spaces. This groundbreaking innovation opens a world of application opportunities due to its incredible price and ease of use. Many applications that were too costly to implement with standard 6-Axis robots, will now be possible. "The VT6L was created based on the highly successful T-Series All-in-One design with built-in controller," said Gregg Brunnick, director of product management for Epson Robots. "This innovation provides an easy-to-use 6-axis solution at ultra low cost perfect for simple applications." The VT6L offers easy integration tools such as vision guidance, with a reach up to 900 mm and a payload up to 6 kg. A feature-packed performer, it includes a hollow end-of-arm design for simplified cabling and more versatile tooling. The VT6L offers 110 V and 220 V power and installs in minutes. In addition, there is no battery required for the encoder, reducing the overall cost of ownership. Epson America, Inc., based in Long Beach, Calif., is Epson's regional headquarters for the U.S., Canada, and Latin America. To learn more about Epson, please visit: epson.com. You may also connect with Epson America on Facebook ( facebook.com/Epson), Twitter ( twitter.com/EpsonAmerica), YouTube ( youtube.com/EpsonAmerica), and Instagram ( instagram.com/EpsonAmerica).